Elizabeth Bathory, also known as the Blood Countess is a 16th century Hungarian aristocrat ranked in none other than the Guinness Book Of Records as the most murderous murderess of all time. In this site we will try to shed some light over who Bathory was. We will try to present two alternatives of the blood countess story. The first alternative (see bellow) is the widely circulated account of her being a cold-blooded killer. We also made a page of Elizabeth Bathory Facts that will help you make a decision about which story is true. 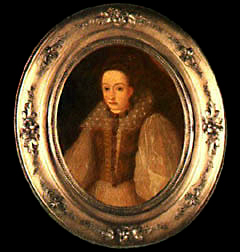 And finally the Elizabeth Bathory Biography will resume her controversial life as a countess. It seems that the Carpathian killer, whose fear of aging knew no reasonable bounds, figured a beauty wash in blood would stem the onslaught of years. Elizabeth Bathory was a turn-of-the-17th century eastern European aristocrat who believed that bathing in the blood of virgins would maintain her youthful looks. Apparently, some 600 young women came to a premature end in order to keep her macabre fountain of youth flowing. How far will people go to secure eternal youth? Cleopatra bathed in the milk, former Indian Prime Minister Morarji Desai regularly drank his own urine and Michael Jackson has had his face rebuilt. No one, however, has gone as far as 16th-century Hungarian countess Elizabeth Bathory, thought to have murdered 600 girls so that she could smother herself in their blood in an attempt to retain her youth and beauty. The accepted story is that Elizabeth, stunningly beautiful, was raised as Magyar royalty. At 15, she was married off for political gain and became the lady of the Castle of Čechtice deep in the Carpathian Mountains, now Eastern Slovakia. In this picturesque setting of small fields, quaint cottages and scampering goats, a horror of unimaginable proportions was about to unfold. Elizabeth's husband, a soldier, was off on various campaigns and life for her was poundingly boring. She began to interest herself in the occult and invited people claiming to be witches, sorcerers and alchemists to the castle. They taught her their crafts in intimate detail and she was enthralled. Elizabeth's husband had a torture device he used to extract information from his Turkish prisoners, comprising silver claw-like pincers fastened to a whip to tear off flesh. When he went on campaigns he left this behind and Elizabeth began to while away the hours using it on debtors thrown into their dungeons. When her husband died, Elizabeth longed for a lover to replace him but she was then 43 and realized she had aged, and her angelic complexion had faded, which put her into a smoldering rage. She was next in line to become ruler of Poland and desperately wanted the job as she was a woman far more educated than those around her, speaking four languages, while the prince of Transylvania was an illiterate boor. Maintaining her youth and vitality became central to this developing plot. Vanity, sexual desire and the thirst for political power combined into a frenzied obsession for Elizabeth. She knew that, without youth and beauty, she would forfeit everything. Her mood deteriorated and one day, as she struck a servant girl for a minor oversight, she drew blood, some of which spattered on to Elizabeth's skin. Later, she was convinced that the part of her arm where the girl's blood had dropped looked fresher and younger. For a woman who believed in magic there was an obvious conclusion. Her complexion had improved because the young girl's blood was full of the spirit of life. Blood was an elixir of youth and, if nature was going to steal her youth, she would take it back from others. When she consulted her alchemists they agreed with her and Elizabeth was convinced she had discovered the secret of eternal youth. With her trusted helper and other sorcerers she roamed the countryside by night, hunting suitable virgin girls. They were dragged back to the castle and hung upside-down by chains round their ankles, naked and still alive. Their throats were slit and blood drained for Elizabeth's bath. When there was a really lovely young girl, Elizabeth would drink her blood from a golden flask but, as her taste for this depravity increased, she'd drink directly from the stream of blood as the writhing body hung from the rafters. From then on, killing became a ritual. As the blood dripped to the stone floor, Elizabeth would smear it all over herself, the smell seeming to intoxicate her. She would kneel by the victim, tearing at the flesh with her teeth, and sucking the wounds. With three or four girls stretched out on the floor, she would wallow ankle-deep in blood. Although she had held off her political foes, after five years of this madness Elizabeth realized the blood of peasant girls was having no effect on her skin. She decided the blood must be defective and better blood was required. With incredible cunning she established an academy in the castle, offering to take 25 girls at a time from cultivated families, and finish their educations. These students were consumed in the same way as the peasant girls who preceded them. It was at this point that Elizabeth became careless for the first time in her horrific career. During a frenzy of lust, four drained bodies were thrown from the walls of the castle and the error was realized too late; the villagers had already seen and identified the girls and the secret was out. The mystery of where those girls had gone began to be solved. Word of this horror rapidly spread and reached the Hungarian Emperor, Matthias II, who ordered the countess placed on public trial. Her aristocratic status meant she could not be arrested so Parliament passed a new Act to remove this privilege and Elizabeth was brought before a formal hearing in 1610. By the final count, 600 girls had vanished, yet Elizabeth admitted nothing. Her assistant and sorcerers were burned alive but the countess, because of her noble birth, could not be executed. Instead, she was damned to a living death, sealed in a tiny cupboard in her castle and never let out. She died four years later, without a word of remorse. To read the alternate version of this story, click here.